From blizzards on the East Coast to frigid weather in the heartland to the rainy West Coast, it’s easy to let the winter season derail fitness. But with great strategies tailored for this colder time of year, you can stay on track to make sure you’re healthy and feeling great by the time those May flowers start to bloom. Here’s some winter fitness tips from our team. Let us know your strategies in the comments! I’ve been taking spin classes at Equinox to switch up my winter workouts. They have a new class called The Pursuit which is like a giant video game that tracks real time data from your bike and shows everyone’s speed & power on a big screen inside the cycling studio. It really motivates you to work harder when you can see how you rank against everyone else in the class! I hired a trainer for the first time ever! Ouch! Even at 30-minute sessions I am in pain. Got myself a new pair of Skechers Sport shoes too—hey, I need to look good working out! 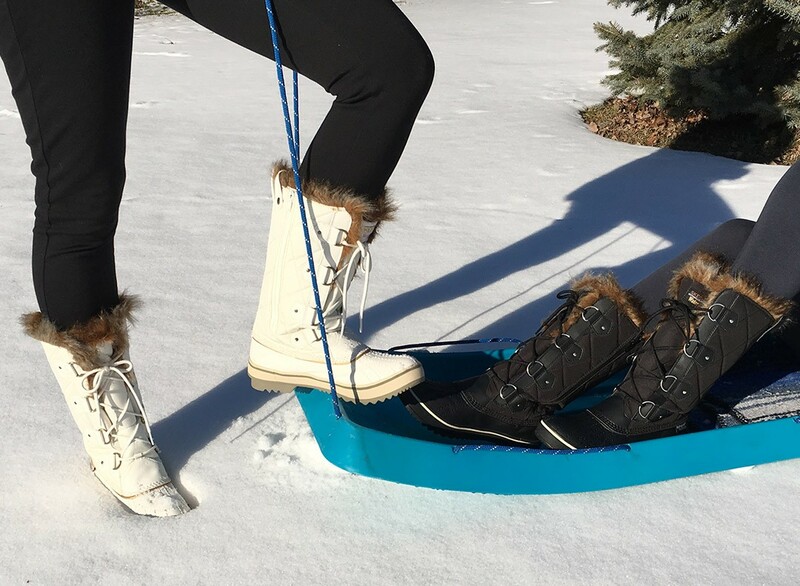 Have you ever taken four kids sledding? Let me tell you, marching up a big snow-covered hill with a sled under each arm 25 times in an afternoon is the best workout I’ve had all year. It can be super hard to get the motivation to work out before or after work when it’s so cold out. To make up for missed workouts, I always take the long route when going through my day. That means taking the stairs instead of the elevator or escalator, parking in a spot far from the store entrance, making sure I stand up and move around the office at least once an hour and any other way I can get a little extra movement. As the biggest Jackie Chen’s fan, I practice kung-fu in my basement during winter. Just kidding, I hit the slopes with my snowboard. A full day on the mountain is quite a workout and it’s totally fun too. And with all the storms we’ve been getting, it’s the best season in years! My winter routine is the same as my summer routine – just with more clothes . . . Running and cycling keep me in shape along with the good old stand-by Pop Physique—a barre-style workout. Proper winter gear is key! For cycling; toe warmers, arm warmers, knee warmers or longer tights, head warmer, long fingered gloves and a windbreaker! For running I opt for gloves and winter running clothes and an occasional rain jacket because I love running in the rain. Luckily no snow here! For me it’s all about circuit class. I get into a serious routine waking up at 5:30AM every day and it’s taken me almost a month to get rid of all the holiday chub. I like having a scheduled indoor class because even in Southern California, we have plenty of chilly, wet mornings—thank you El Niño—where it’s tough to motivate for a run. I also stick to drinking only water and go Whole30 on the diet which works wonders as an annual nutrition reset. During the winter when getting outside for workouts is challenging, I focus on body weight exercises that I can do at home, as well as specific strengthening moves to maintain balanced muscles (e.g. strengthening my glutes). Also, diet is a focus during the winter, especially after the holidays! I try new recipes at home, drink lots of water and try to avoid any bugs going around between kids’ school and work! During the cooler months I do more indoor activities – currently I am obsessed with Soulcyle – You climb, jog, sprint, dance, even use weights, all while on a bike – it is a total body, core workout that will leave you breathless and feeling amazing results! Yoga at home, first thing in the morning. It’s easy, convenient and really affordable with DVDs or online exercises – and a great way to start the day. My current favorite workout for these colder months is lots of cardio. I try to run or hike a little more and layer up. It’s easier to shed a layer in the winter than it is to stay cool in the heat. Plus, once it starts raining, we get to see the waterfalls along the trails. I don’t mind running in the rain, it’s fun and takes me back to my childhood when it was cool to jump in puddles and get wet. A winter workout that I enjoy is kickboxing! You build so much strength and it’s a GREAT stress reliever!